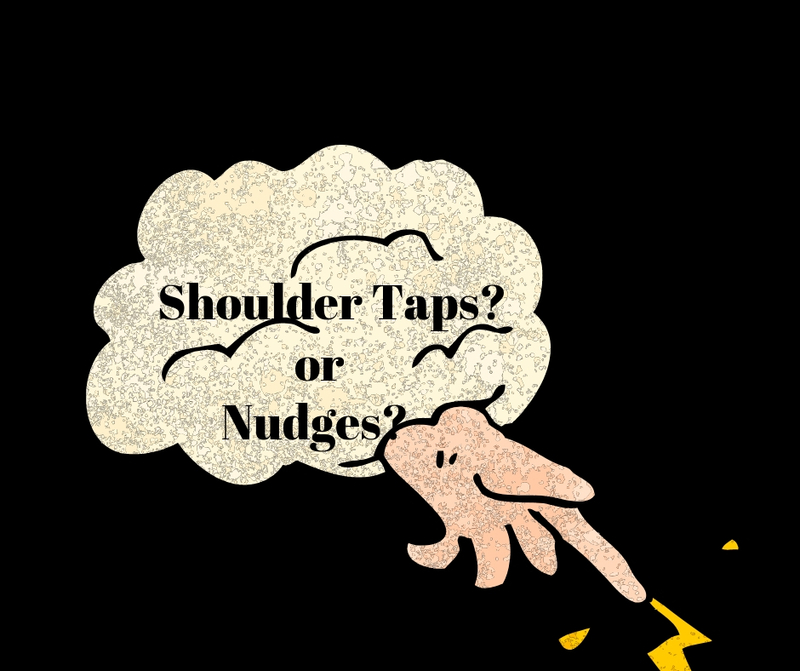 Shoulder Taps or Nudges? Which one does it take for you? Last week I received a Facebook post. The man on the screen tells a story I can relate to. He is sharing a story about being in a restaurant and seeing an elderly lady walk in. He hears a voice in his head that says to him, “You really need to go over to that women. You need to tell her how pretty she looks today.” He tries to ignore this, but on his way out of the restaurant he stops at her table, kneels down and say to her, “If no one else has told you today, I want you to know how lovely you are.” She looks at him and responds, “I know you.” The man responds, “No, I don’t think so.” She says, “I know your spirit.” It gets really quiet. “My husband died a year ago and that is something he would have said to me.” The man is overwhelmed and tears flow down his face. In his post, the man goes onto say that God taps us on the shoulder and uses us at just the right moment. “Yes,” I say to him, although he cannot hear me. I get it! The same thing happens to me. Only I get nudged, not gently tapped on the shoulder. I guess I have to be shoved a bit harder to get my attention. My mind flips through hundreds of times God has nudged me. It goes something like this – an image of a person appears in my mind. Then I get the words, “You should touch base with them.” And if I don’t act, I keep getting the person’s image in my mind until I take action. Almost always I find there is a reason why I was supposed to do this. Sometimes it is just that there are so many things happening in their life and they needed someone to reach out and listen. Sometimes, it is something not so obvious. Sometimes, I don’t get a reason until much later. But if I am obedient, I will always understand why. I have learned that when I do get nudged there is a blessing waiting for someone. My obedience is rewarded with a blessing also. How many times have I missed this blessing because I ignored the nudge? I shudder when I write this. I believe this is the Holy Spirit working in me that draws me to do something for someone. To step out of my comfort zone and be bold. My lesson is to obey and not question too much. Maybe that is why it takes a nudge – a tap for me doesn’t do it. Do you get nudged? What happens when you step out in obedience and boldness?